When I made those delicious Masala Vadai recently I had some batter left over. I dint want to fry them once again - I mean even my weighing machine fairy will not forgive me!! So what did I do? Obviously bake them! " What Baked Masala Vadas? Are you crazy? " - Heard ya. 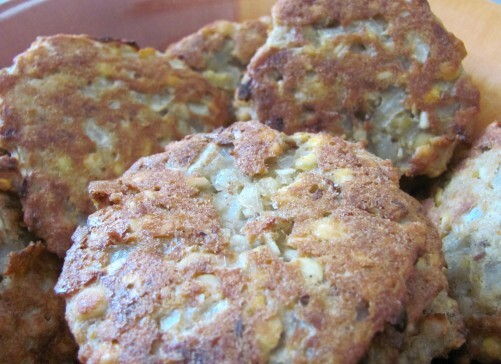 Of course its nothing like the fried ones, but better baked than not eating at all - I say!. I have to tell you - when you bake them, the aroma seems multifold, dunno why. If you don't believe me - try it yourself. Method is very simple. Preheat the oven 400F. 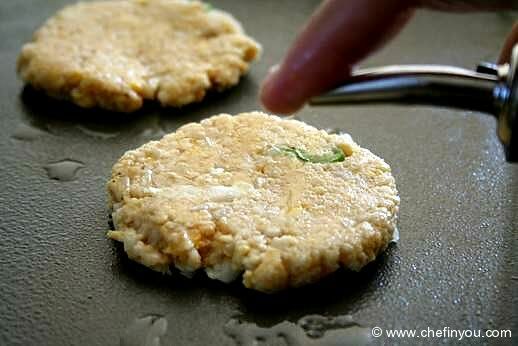 The trick is to flatten the fritters as thin as possible and cook it fairly quickly. Otherwise, if thick - they don't get done on the inside. Or if cooked for a long time, they get dried out faster and taste like rubber.Grease the baking sheet with PAM spray (or oil), drop spoonful of batter spaced out and spread it thinly. Pour out wee bit oil on top to avoid drying out and to enable it to brown well. Bake them for 10-15min ( approx.time depending on your oven). Lift them in the middle to check if they have browned on the underside. Flip them and bake again for another 10min until golden brown. Remove and serve immediately. Just like the fried ones - these are best served the minute they are made. 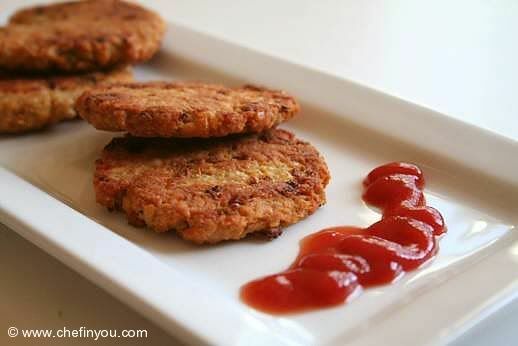 Serve with ketchup or any condiment of your choice. I made exactly the way described. I have to keep each side 18 mins. They turned really crispy. Placed them poarchment paper so you dont need to put any grease or oil. Turned out really good. Uma, Thanks for the receipe. Healthy snack, when baked. Made this along with Bisibele bath. Usually have boondi with bisibele bath, but, tried out this & it went very well. Thank you. correction I shouldn't have said its always roasted, it is often roasted and cooked. there are reasons for it. 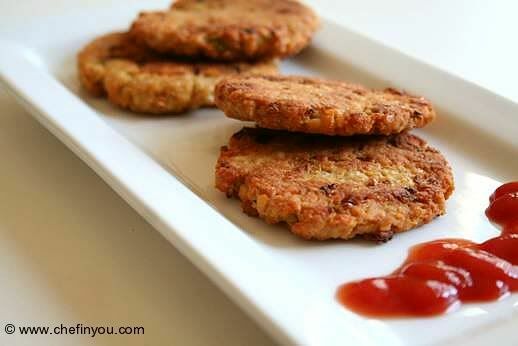 I make baked masala vadas by first steaming them and then baking. It doesn't stick and turns out almost like fried ones. Spray a little oil in the sheet and on top of the steamed vadais too. So I tried these, but unfortunately the baking didn't work. I had left them in for less than 8 minutes and they were sticking to the nonstick baking sheet, even after putting a lot of baking spray. Any suggestions? Thanks! Just tried these. Pretty impressed :-D .
Hi, My baked vadis do not turn brown, why would that be? 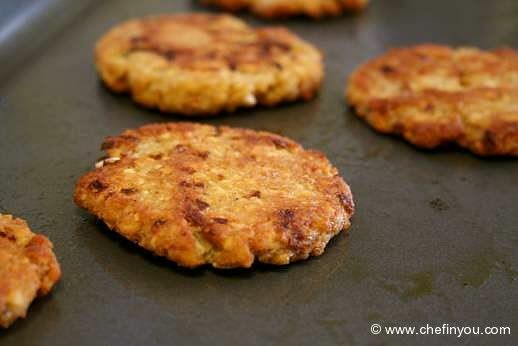 Have tried baking chaklis as well, same issue. I think its cos of uneven heat/not enough heat. all your comments on jugalbandi see to be going to spam. re: roasting, it's not the time that matters when i comes to killing enzymes. it's the temperature - raw food is anything below 140F, but even between 120 and 130 is believed to kill some bacteria and yeast. I've got to bake these as well. They look beautifully brown and crisp. Those look amazing! I will have to try them soon, my husband will love them! Thanks for the idea. 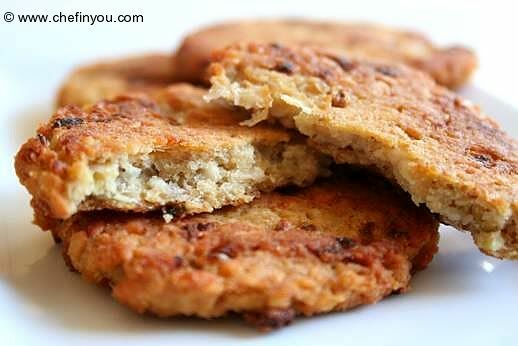 I would call these masala cookies or Indian cookies! Call it healthier version oh now that we can relish on every deep fried item with baking and MV making things simple as well as healthier!!! the vada looks great!!! Oh wonderful! I am so glad you posted a baked version of these delights. Wow the baked wadas looks like same as u deep fry the wadas.Yummy vadas. 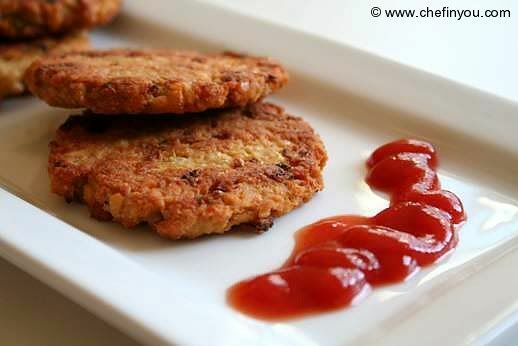 Wow wat a healthy way to have masala vada..looks prefect and crunchy! DK..Baked Look's just perfect as fried one's. once i have tried with Banana flower vadai. the taste was so similar.. Healthy and yummy.. Baking vadai is new to me. Will try these. DK, believe me or not I also baked masala vadais day before yesterday and was going to post it shortly. It comes out so well right! It sure does Madhu! I esp. was enamored by the aroma while baking! It was more so than when you fry!